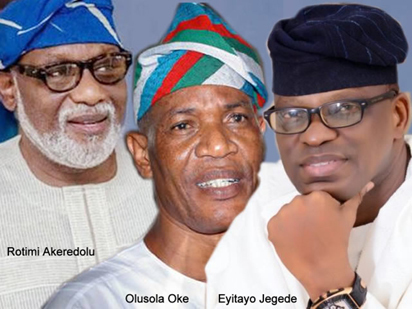 Who won Ondo election 2016 as Updates start to come in. One of the most anticipated news in Nigeria right now is the Ondo election results 2016.We bring you the earliest results coming in here and you can see which party is ahead in the race. There has been a steady flow of news on the social media as well as some news agencies,but INEC is yet to give the official results itself. battle that spilled into the pages of National newspapers and social media.Femi Fani Kayode in particular had a nasty war of words with Ibrahim on social media.Thankfully,the election itself has not gone that way as things have been relatively peaceful among voters and citizens. It was monitored by local and international observers. Oluwarotimi Akeredolu represents the APC. (8)Ward 6 unit 1, Akure South, Ilekun Oda Road. AD 44, PDP 50, APC 53. (12) Results in… Unit 17 Igboroko (Ahmadiya grammar school) 2 ward 3 Owo LG. AD…. 01 PDP…..05 APC….. 262. (18)Ondo west LG Ward 7 Unit 34 AD 41 APC 22 PDP 128. (20)Ondo west LG, ward 10, Unit 8a, APC 28, AD 28, PDP 49. (24)Oba- Ile, Akure North Ballot 060888.. AD. 31. APC 82. PDP 50. (39)ENUOWA/ OBALALU, UNIT 8, WARD 1 ONDO EAST: PDP 117, APC 61, AD 36. (31)Ondo west LG Ward 7 Unit 34 AD 41 APC 22 PDP 128. (34)Ondo west LG UNIT 36 AD 23 APC 17 PDP 71. (39)Unit 3, Ward 7, ONDO WEST (Ansarudeen): PDP 135, AS 36, APC 57. (47)Asuada Palace, Ward 9 Unit 17: PPN- 1; APGA- 1; LP-1; APA- 2; PDP- 6; AD- 9; APC- 148. (52)Lumeko unit 005 Ode Aye ward2 Ad-57, Apc-139, PDP-57. (59)Ward 6 unit 1, Akure South, Ilekun Oda Road. AD 44, PDP 50, APC 53. (62) Unit 17 Igboroko (Ahmadiya grammar school) 2 ward 3 Owo LG. AD…. 01 PDP…..05 APC….. 262. (68)Akure Sourton ward 2 unit 32 APC-57 PDP-106 (18)Ondo west LG Ward 7 Unit 34 AD 41 APC 22 PDP 128. (72)Unit 23, Ward 7, ONDO WEST (Akure Garage): PDP 178, APC 45, AD 38. (79)Ondo west LG ward 10, unit 9 APC 50 Ad. 30 PDP 96. (82)Akure Alagbaka pry school. Polling Unit PDP 147, APC 138, AD 118. (88)Ondo west LG, ward 10, Unit 8a, APC 28, AD 28, PDP 49. We shall bring you more updates as they come in.